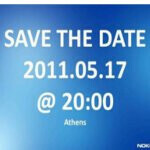 Nokia is holding an event on May 17th in Athens - maybe in regards to WP7? May is surely turning out to be one busy month for the mobile industry, especially when many are hosting their own events, but now you can add Nokia into the mix as well. It has been quite some time since we’ve really heard anything in regards to Nokia’s future direction with Windows Phone 7, but they now have an event penned for next week on May 17th in Athens, Greece. Granted that details surrounding the event are slim and non-existent at this point, one can’t help but think about the possibly of hearing something related to hardware announcements. On the flip side, it could be something totally different and far away from Windows Phone 7. In any event, we’ll surely know soon enough since it’ll be happening in just over a week from now. Any other mobile companies want to come out and announce an event in May as well? Now is probably the best time! maybe ur a douche bag... oh wait u r... and where did anything about apple be said? Hopefully its the release announcement of the Nokia N9 with Windows 7, lol. Hopefully they'll announce it was a mistake to cut off Symbian and they will continue to develope it to rival iOS and Android. BUT then again Nokia always knows how to disappoint their customers. I don't know...Nokia has the money, the need, and the man power to change WP7 into something even better. And having Microsoft as a familiar face would open then up a more accepting American audience. I am still weary about the partnership, but I don't think Nokia is going to completely kill themselves off with one bad mistake. Maybe MeeGo device is coming ;) (At last, and the only one for now). I don't think that it could be possible that WP Phone would be ready and I think that Nokia WP will come when WP Mango update comes - so, no Nokia WP yet.